Fox Management, Inc. is a full-service property management company for all your residential and commercial property needs. We specialize in single family homes, small plexes, small apartment buildings and small commercial buildings. Our management agreement is tailored to each property owners' needs and level of involvement. While each property is unique, so are the needs of property owners. Fox Management, Inc. can keep your mind at rest while out of town or here while you are working. Our personalized service is very efficient and professional. Fox Management, Inc. is a member of NARPM (National Association of Residential Property Managers) and RHAGP (Rental Housing Association of Greater Portland) and this enables our company to bring clients' the most recent industry trade secrets. Fox Management, Inc. emphasizes prompt vacancy preparation, maintenance and tenant retention. Tenant retention is a high priority. Prompt maintenance and response to tenant concerns will increase tenant satisfaction and lower vacancy rates. Security is also an issue for tenants and owners; key control, prompt response to safety issues and careful tenant screening can increase a tenant's sense of security and reduces the risk of liability for a property owner. We will be available 24 hours a day to handle tenant emergency calls and be able to forward them to the appropriate staff person so the tenants never feel they are on their own. Please visit our Portland Property Management Education Blog. Call Fox Management, Inc. today, or complete the form to the right, for your free rent analysis and management consultation. We are available during the work week and on weekends for appointments. Our phone calls are answered promptly and we look forward to working with you and your property. We can recover all utility costs. Increase the property value and increase your Net Operating Income with our RUBS (Ratio Utility Billing System). 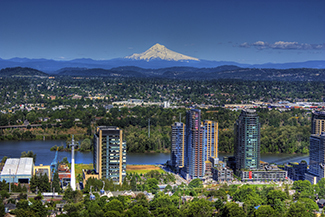 Portland is the largest city in Oregon, located near the confluence of the Willamette and Columbia rivers. Portland is located in the Willamette Valley region of the Pacific Northwest, between the Pacific Ocean and the Cascade Mountains, and its climate is marked by warm, dry summers as well as damp, cool-to-chilly winter days. This climate is ideal for growing roses. For more than a century, Portland has been known as the "City of Roses", with many rose gardens – most prominently the International Rose Test Garden. The city is also known for its abundant outdoor activities, liberal political values, and coffee and beer enthusiasm. Portland's location is beneficial for several industries. Relatively low energy cost, accessible resources, north–south and east–west Interstates, international air terminals, large marine shipping facilities, and both west coast intercontinental railroads are all economic advantages. Like most large cities, Portland has a range of classical performing arts institutions which include the Oregon Ballet Theatre, Oregon Symphony, Portland Opera and the Portland Youth Philharmonic.